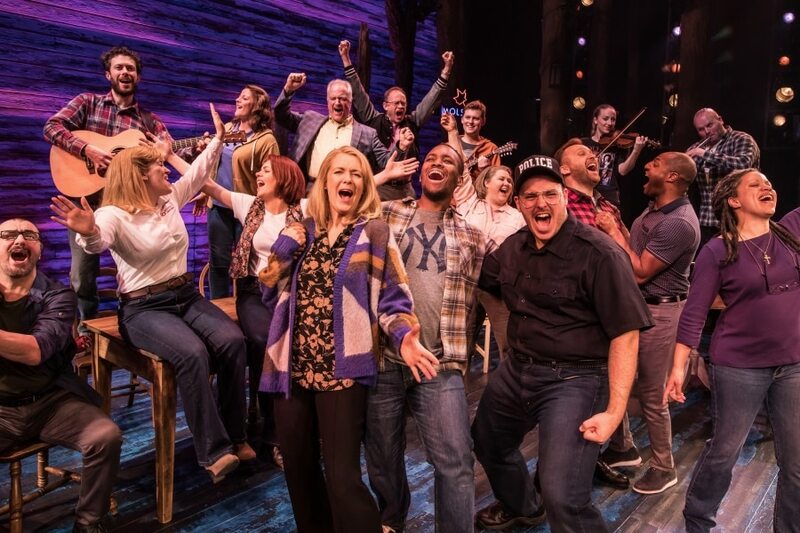 Douglas Mayo reviews Come From Away, a new musical by Irene Sankoff and David Hein now playing at London’s Phoenix Theatre. With no less than 42 producers above its title Come From Away has made its way across the Atlantic to London’s Phoenix Theatre, and to those 42 producers I offer sincere thanks, for this is not your normal musical fare but a tour-de-force with an ensemble cast that us unequaled in the West End at this moment in time. 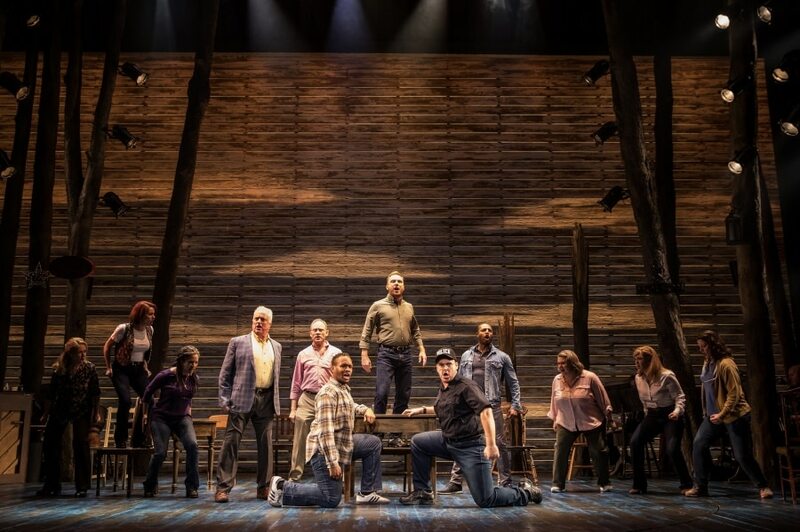 Set in Gander, New Foundland (a rock in the middle of the Atlantic), Come From Away is an extraordinary story of ordinary people making an extraordinary difference. Over the course of one astonishing act, twelve of the best British actors play the dozens of inhabitants of the Rock and tell a story that has to be seen to be believed. Sankoff and Hein based this musical on the transcripts of hundreds of hours of interviews with Gander residents and after editing and distilling down the essence of the story provide a great evenings entertainment made all the more potent by the fact it’s a true story. There is no way to highlight individual performances here. To Jenna Boyd, Nathanael Campbell, Clive Clarter, Mary Doherty, Robert Hands, Helen Hobson, Jonathan Andrew Hume, Harry Morrison, Emma Salvo, David Shannon, Cat Simmons and Rachel Tucker I offer incredulity and respect at the feat you pulled off on the two occasions I have seen the show. Characters are switched on a whim, movement remains constant, and laughter and tears flow as this story unravells on the Phoenix Theatre’s stage. One wrong step and something aking to a motorway pile up could be imagined. Director Christopher Ashley and Kelly Devine (Musical Staging) together with Beowolf Borritt’s seemingly simple set design place the human drama of this musical front and centre. Toni-Leslie James’ costumes allow the entire town of Gander and thousands of others to magically appear on stage. There’s never a dull moment with all this action being backed by Alan Berry’s onstage band comprising Matt Bashford, Aoife Ni Nhrian, Mark Wraith, Justin Quinn, Joey Grant, Ray Fean, and Dan Day keep the pace in this one act musical moving with some stonking arrangements by Ian Eisendrath. I’ve not seen an audience as engrossed in a show for a while. Buy a ticket, suspend your disbelief and I guarantee you will walk out a better human being. To quote Clive Carter’s Mayor “Tonight we honour what was lost, but also commemorate what we found”. What I found was a spark of hope, especially in today’s troubling times, that when called people might just surprise you with an unfetted display of human kindness! Just go see Come From Away! Five stars just doesn’t seem enough!